The Kawasaki Ninja 400 is a sweet motorcycle that is hard not to fall in love with. 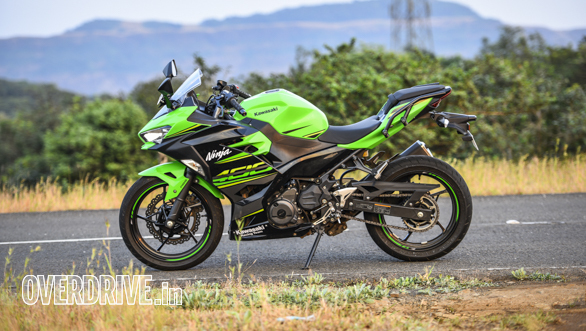 Designed to help newbie riders cut their teeth in the world of supersport motorcycles, this baby Ninja also packs enough performance to satiate the experienced crop. While our road test gives you an in depth idea of what the 400 is like to ride, we've made a list of what we liked and disliked about the Ninja 400 for those who'd like a brief account. At first glance, it may appear like Kawasaki's design team kept the flagship Ninja H2 and Zx10-R as reference models while penning the lines on the Ninja 400, we think they've done a fine job. 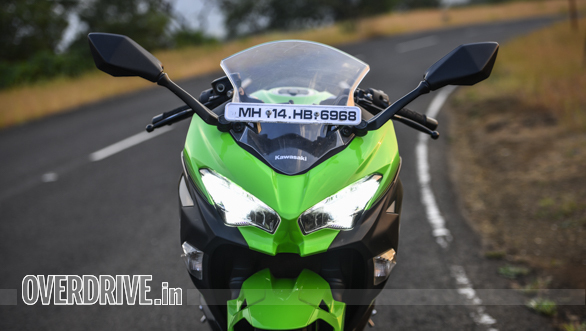 The seek LED headlamps are encased in a fairing with a prominent chin spoiler a la the H2 while at the rear, you could swap out the Ninja ZX-10R's tail lamp for the 400's and find it hard to tell the difference. But this does not imply that the Ninja 400 is devoid of a personality of its own. 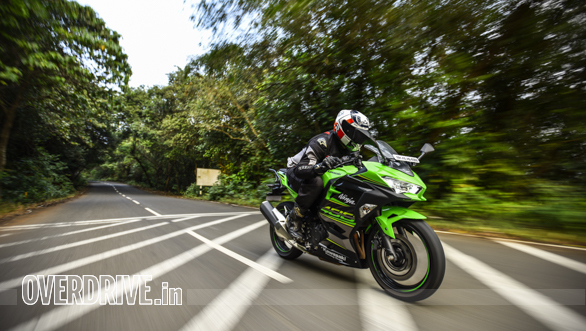 It actually looks great, especially in the Kawasaki Racing Team (KRT) colours which is the only colour available in India, for now. So, all of those who were looking to fly under the radar with this bike should ideally look at something else, or maybe paint the whole bike in black. The bike grabs attention as if it were a litre class machine and that may or may not be a good, depending on personal preferences. I, for one, liked the appreciative stares that the bike garnered and as a brand, the word Ninja evoked a positive thumbs up from many bystanders. The 49PS, liquid-cooled parallel twin motor is a gem and what makes it so is its ability to deliver, no matter the situation. So at low speeds, in traffic, you can pootle around at low speeds in high gears without a sign of complaint from the motor. There's barley engine heat to speak of as well. And once you whack the throttle open, the bike surges ahead with a sweet exhaust note post 7,000rpm. And it'll do this all day long. In fact, it's pretty calm at highway speeds. 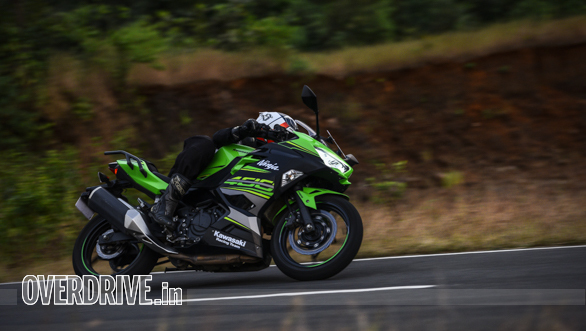 For all its mean, green looks, the Ninja 400's riding position is anything but aggressive. The foot pegs, though rearset aren't too far back and the clip-ons aren't too low to put you in an uncomfortably committed riding position. In fact, the riding position is spot on for commuting and touring as well as the occasional track day. 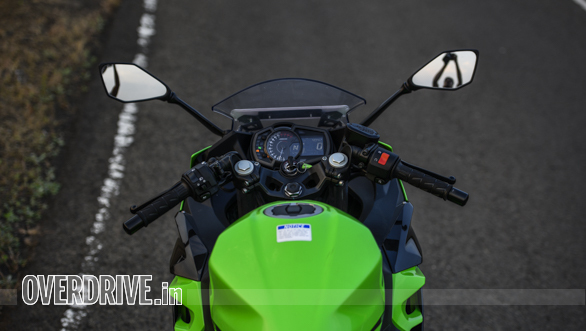 The new trellis frame, beefier front forks and sharper steering geometry have made the Ninja 400 a sweet delight in the corners. Turn-in is predictable and precise which ups your confidence in the bike and the longer swingarm (than the Ninja 300) translates to superb mid-corner stability. The feedback you get only eggs you to push harder and even when you go slightly overboard, this Ninja's got your back. In all, its a full on entertainer if canyon roads are your thing. The new brakes are pretty good at shedding speed and the ABS is well calibrated, so it doesn't kick in unless absolutely necessary. Yes, we are talking about the hideous grab rails and the barbeque grille style saree guard that the bike ships with. I can't believe Kawasaki actually went the extra mile to drill holes in the rear panels to accommodate the tubular grab rails. The saree guard (thankfully not part of our shoot bike) is another eyesore that's you'd do a big favour by yanking off, after taking delivery of the bike. For its price, the lack of adjustable levers is hard to contend with. 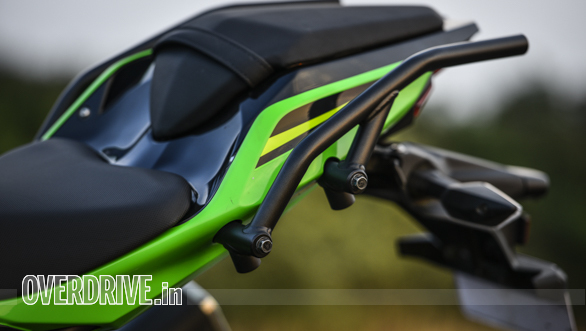 These levers go a long way in enriching the experience of riding such a bike and I think Kawasaki must consider this in their update for 400. It's the price that makes you put down that cheque book and ponder on whether or not the Ninja makes a worthy proposition. It is a fantastic motorcycle, that we've already established, but the Rs 5.75 lakh on-road Mumbai price is what's unfathomable. 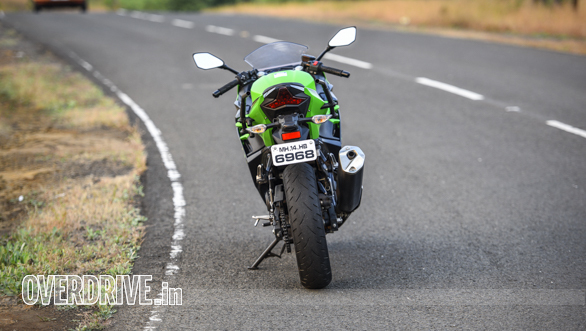 For that kind of money, 650cc motorcycles like the Kawasaki Z650 or even the Ninja 650 seem within reach, if you consider a slight rise in monthly EMIs. 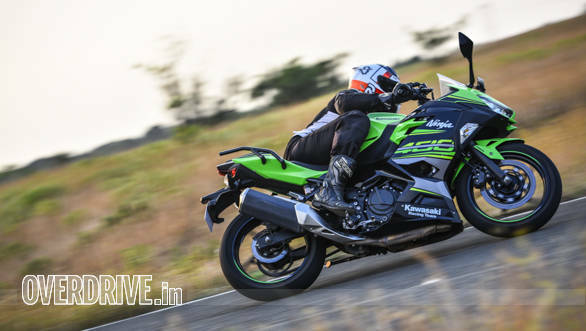 A reasonable price for the Ninja 400 is what will lure the customer towards it and I think Kawasaki should act on this before a good product fades away.